Subtitles in 19 different languages! 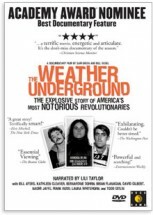 Two DVDs for one low price: The Universal Language and Sam Green’s Academy Award-nominated documentary The Weather Underground. 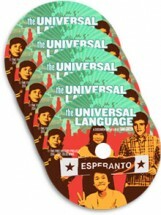 Buy The Universal Language poster! Designed by the fabulously talented San Francisco artist Favianna Rodriguez. 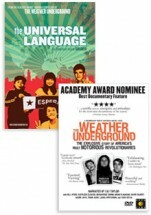 Poster available in both English and Esperanto versions. Save $30 when you order this combo-pack of 5 DVDs. 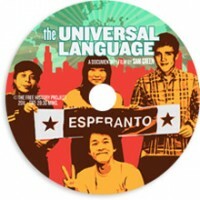 A Universal Language DVD is a great holiday gift for family and friends. The Oscar-nominated documentary film follows the rise and fall of the 1960s student group that tried to violently overthrow the US government. Find out the real story behind Barack Obama’s “terrorist pal” Bill Ayers! Available on DVD for the first time is the breakthrough documentary. Also included on the disc: a number of award-winning short films by Sam Green. Sam Green films - combo pack! 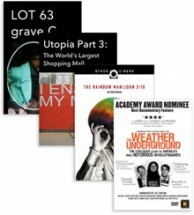 For $50 you get four DVDs: The Weather Underground, The Rainbow Man/John 3:16, plus lot 63, grave c and Utopia Part 3: the World’s Largest Shopping Mall. A mind-bogglingly good deal!